Megaret Pandan, a sacred Bali Aga tradition. Tengenan is a beautiful traditional Balinese village and has unique traditions. Located in Karagasem, East Bali. Setting the location of the building, the location of the temple, the model of the house to the size of the house is made by following traditional rules from generation to generation. Traditional Tenganan houses usually have the same shape and size, made of the same material namely red stone, river stone and land and the roof is made of straw. The entrance to the house is only the size of one adult and the top of the door blends with the roof which adds to its beauty. Ancient buildings with rice barns and wooden storage areas and halls or stages are located in the middle of the village interspersed with several halls which are provided for villagers to gather just for a break or do traditional activities. Magaret Pandan (pandan war) is a routine war training procession (usually in July) to train the physical and mental of the villagers by complaining two village youths to fight on the pole and slashing each other's bodies using pandan leaves. The customary processions are carried out as an attraction for domestic and foreign tourists, so that in certain days the village is visited by tourists. 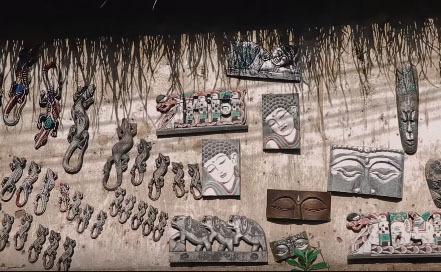 In this village we can also witness directly the artists who are carving, painting on palm leaves, weaving and making woven bamboo as their livelihood. Tourists can buy directly from the artwork. And enjoy the comfort and beauty of Tengenan Village. 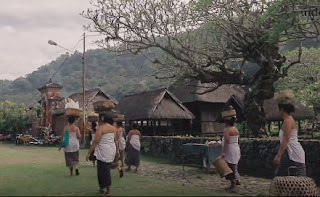 To reach Tengenen Village, which is located in the Manggis sub-district, Karangasem regency, Bali, we estimate it will take 2 hours from Denpasar, across Goa Lawah, Padangbai and Labuhan Amuk. About 100 meters before entering the Candidasa area there is a junction, then I turn left and there are two beautiful green hills. In this valley the village of Tenganan is located. And one more reason why many tourists visit the Tenganan traditional village to buy Gringsing cloth, which is one of the ancestral remains of the village of Tenganan, where it uses double weaving art in its making besides Japanese Kimono and Indian. Gringsing cloth is the only traditional Balinese woven fabric that is made using double tie technique and requires a long time between 2 to 5 years, because the colors contained in gringsing are from plants and require special treatment. That makes this cloth expensive, and only produced in Tenganan villages. Double tie weaving has more complexity than ordinary single tie weaving. In double tie weaving, fabric motifs have been planned since color making on the thread. In the art of weaving Gringsing is known to be 2 kinds of thread, a vertical thread called Lusi and horizontally called Feed. The two threads are vertical and horizontal, the color of a thread is different, and must be woven so that a planned motif can be formed. Making Gringsing fabric from the beginning to the end is done by hand without using a machine, all of them are done with tools that are still traditional. The yarn used to make the fabric is obtained from kapok seeds. 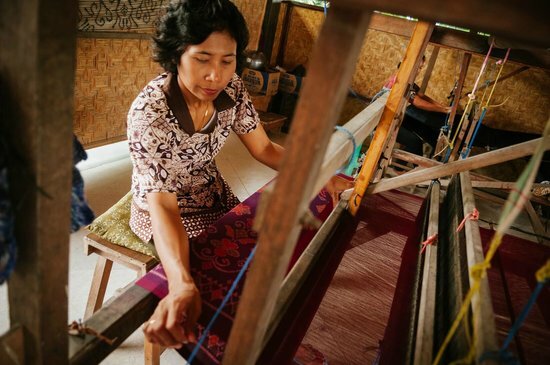 While the colors used in making cloth only use three colors or often called tridatu as a symbol of chastity for Balinese people.